Rabbi Yaakov Ifargan, a tzaddik, offers help to a blind Jewish man. Many believe tzaddiks have supernatural abilities to look into people’s lives and show them the right path to follow. Time Life Pictures/Getty Images. A tzaddik (or zaddik; literally, “a righteous man”) is a title usually given to the leader of one of the various Hassidic Jewish groups. The tzaddik is generally considered to be a person who has conquered his (or occasionally her) evil inclinations, such as pride, to live a life of humility. They strongly identify with the oppressed. Righteous people are often also believed to have extraordinary spiritual or mystical powers. Many consider Noah to have been the first tzaddik. He is described in Genesis 6:9 as a “just man and perfect in his generations, and Noah walked with God.” The idea of a just person has been discussed throughout Jewish history. Scholars have argued over how many there were at any given moment, noting that many would be ordinary people whose goodness would go unacknowledged by their own local community. These people form a class known in the Jewish tradition as the hidden tzaddikim. However, in the eighteenth century the term began to be applied especially to the leadersof the emerging Hassidic movement, an orthodox mystical sect that arose in eastern Europe. As the leader of a Hassidic community, however, the tzaddik is a public person to whom is ascribed supernatural abilities. People bring to the tzaddik a spectrum of spiritual and mundane problems with the hope of receiving miracles or some kind of extraordinary insights. Many believe that the tzaddik has special knowledge of the purpose for an individual’s life, and that they can thus draw information by accessing the deepest levels of a soul. Thus, members of the community tend to listen carefully to the admonitions and words of guidance from these rebbe (holy men). Among the most famous tzaddiks of the last century were Aryeh Levin (1889–1969), Joel Teitelbaum (d. 1979), and Menachem Mendel Schneersohn (1904–1996). Rav Aryeh, as Aryeh Levin was popularly called, lived in Jerusalem in the days both prior to and just after the formation of Israel. He became particularly well known for his compassion and concern for the sick and those in prison. He regularly visited the local lepers’ hospital and worked to refurbish its facilities. He also visited the central Jerusalem jail, which housed many political prisoners, and held prayer services there on the Sabbath. Teitelbaum, the head of the Satmar Hassidic community, was best known for his opposition to Zionism and the secular state of Israel. He believed that the establishment of a religious state in Palestine would be accomplished by God and that the Jews should wait for God to accomplish that end. He saw the founders of the present state of Israel as wrongfully assuming God’s prerogative. Schneersohn was the leader of the Lubavitcher community, which under his leadership became the largest and most geographically widespread of the several Hassidic groups. It became the focus of Jewish messianic expectations toward the end of his life. As the level of devotion grew, many came to see him in unique terms. They believed he had supernatural powers of insight and that he could even alter the course of world events. Miracle stories were collected and circulated about Schneersohn. When he died, many believed that he would return, and the Lubavitcher community decided to wait for him before taking any further actions. In the years since his death, his followers have yet to name a new leader. Dresner, Samuel H. The Zaddik. New York: Schocken Books, 1974. Jacobson, Simon. Toward a Meaningful Life: The Wisdom of the Rebbe Menachem Mendel Schneerson. New York: William Morrow, 1995. Raz, Simcha. A Tzaddik in Our Time: The Life of Rabbi Aryeh Levin. Nanuet, NY: Feldheim, 1978. A tzaddik is a righteous, law-abiding person committed to the ideal of tzedek, justice, righteousness, charity. Elimelekh and many others of the Maggid's inner circle remained committed to a more elitist vision that continued to place the Tzaddik at the center of the religious experience and limited the agency of the masses. 83) I believe the Gra's comments need to be understood in light of his extreme rejection of the Chasidic concept of the tzaddik, a figure in many ways modeled on the biblical Moses. La palabra que se le opone es tzaddik --que en arabe, por cierto, quiere decir << amigo >>--, termino que puede traducirse por justo, recto, equitativo. Pero hay un hombre llamado Tzaddik, que quiere hacerle dano a ella y a su hija. Opening the Thematic Threads section of the volume (Part Three) is another exploration of Malamud's use of Jewish folklore: Lillian Kremer focuses on the legendary figure of the tzaddik (righteous man) and his function as moral mentor/ guide, as source for characters such as Salzman in "The Magic Barrel" or Susskind in "Last Mohican" and "Pictures of the Artist. The tzaddik," as a righteous person is known in Hebrew, "is just an emissary," he says excitedly. The subject might sound esoteric, but Tzaddik was the only sold-out hit at Canada's Ashkenaz '99, a festival of new Yiddish culture. He confirms that Remuh Cemetery is the place where Trotsky's biographer, my friend Isaac Deutscher, ate a pork sausage as a youngster on the Day of Atonement atop the tomb of a famous tzaddik and, having thus tremblingly defied Jehovah, emerged an atheist. Life can go both ways, without any apparent logic, though the sages earnestly searched for the logic and Rabbi Yannai had to conclude that the explanation "is not in our hands"; only God knows the answer, and no human being can predict how things will turn out for a given tzaddik or rasha (Mishnah Avot 4:19). 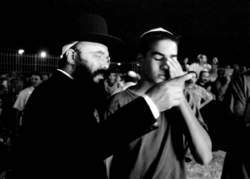 But uniquely, notes Heilman, Hasidim claim that the tzaddik, or righteous leader, has a mystical connection to the biblical prophets, which is transmitted through the "holy seed" at the birth of a male descendant. A person of righteousness is a tzaddik, and Noah was described as such.